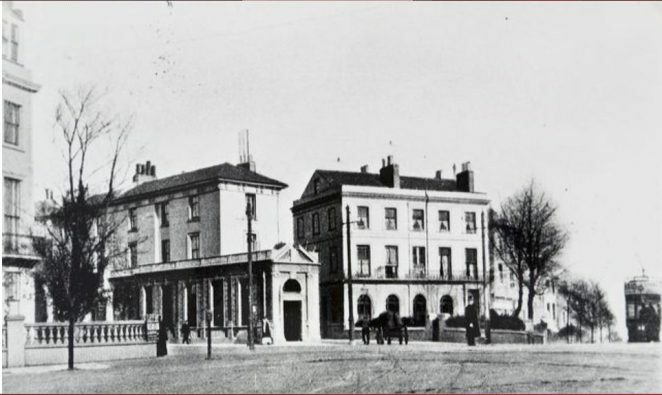 The photograph above is Seven Dials crossing, in January 1908. If you look closely you will see a policeman on traffic duty. It is difficult to believe that a policeman was needed to control traffic in those days. The above photograph was taken in late 1932. The traffic is now regulated by semaphore signals operated by the policeman who is safely ensconced in the box. 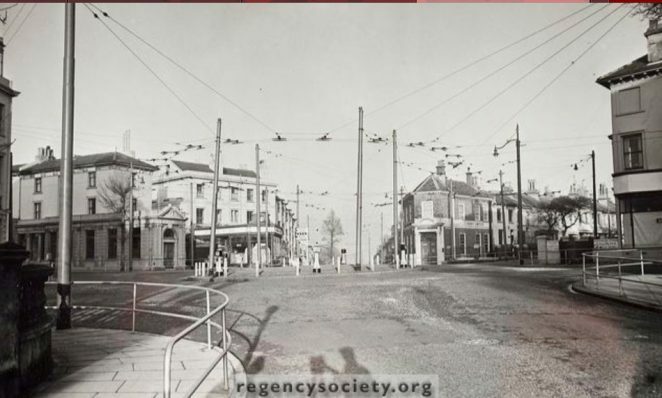 The view above is of Seven Dials in 1955, complete with lamp and trolley bus standards and guard rails. Photographed in 2013 this is the Seven Dials roundabout known as one of the most dangerous in the city. Let us hope that existing plans to improve this traffic nightmare are put in place soon. We all hope that the roads are made safer, but I for one hope that they do not go ahead with the idea of increasing this particular roundabout to 25m diameter. That will only go towards causing more congestion with subsequent additional pollution and more road rage. Not exactly well thought through methinks. I don’t know what the answer is – I’ll leave that to the experts. But negotiating a mini roundabout with so many exits is a daunting experience – and I’ve been driving for 25 years! I crossed this death trap a few years ago on a very hot day when visiting relations in the area. It is fairly lethal for pedestrians (especially if you’re new to it! ), let alone drivers, so something is required to calm the traffic flow. Perhaps it wouldn’t be such a daft idea to go back to a police controlled system. I agree that a wider roundabout will merely exacerbate the problem, and probably cause road rage! I’m afraid the “experts” don’t always get things right. Why not try enlarging the central island temporarily, using a relatively inexpensive, removable structure, to see what effect this has on the traffic flow? If it works, install a permanent island. If it doesn’t, revert back to the original. The results would very quickly become apparent, and with minimal cost. By the way, I love the 1955 photo, with its circle of trolleybus poles and overheads. It also looks as though the shadow of the photographer and his/her equipment appears at the bottom, just above the “society” part of the caption! Oh, yes. The ’55 pic is how I remember the Dials best, with the turning circle for the 44 trolleybus before these were withdrawn and their motorbus replacements were routed down Montpelier Road and on to the Steine. 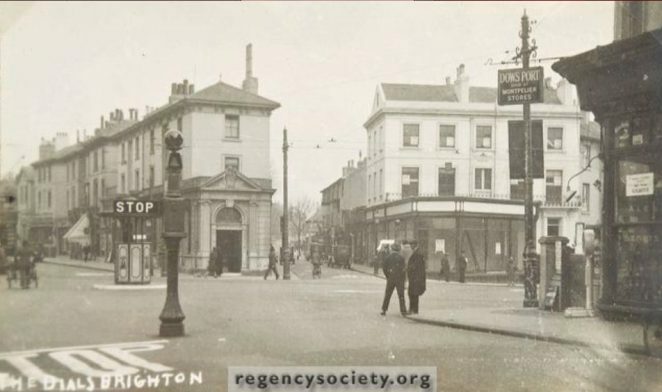 Always a pain in the neck for pedestrians, with so many turnings to cross if you wanted to get straight across the roundabout, but somehow in those days we weren’t in so much of a hurry and just took it as we found it. 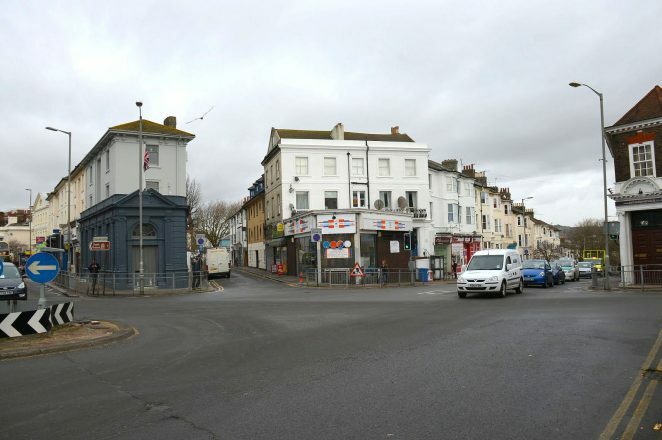 At the risk of sounding flippant, I have to say that the best thing about Seven Dials was an unrecorded song of the same name by the local band Amazorblades, who frequently played local venues (but especially the seafront Alhambra) in the latter part of the ’70’s. With regard to the contribution made by Sedat Nemli, what about the current Brighton based band, The Dials, whose third album, The End Of The Pier, was released last year. I assume that they took their name from the Seven Dials.